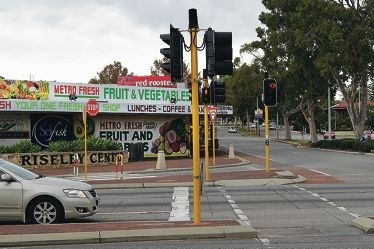 The City of Melville held the meeting to discuss development plans to improve the Riseley Centre precinct, which is the area surrounding the Canning Highway and Riseley Street intersection, including the commercial and residential areas. Mayor Russell Aubrey said something needed to be done with the area, which was subject to excessive traffic and parking issues and needed improvements to the shopping centre. ‘We are progressing with the plans for Riseley Centre and want the public to get involved in the planning process,’ he said. Mr Aubrey conceded parking and traffic congestion were the major concerns for the community and said they were working on solutions, suggesting underground parking and better public transport as possible solutions. But fed up locals said the City’s planning was at the same place it was five years ago and that parking and traffic issues needed to be resolved first before development started. One local said traffic build-up along Riseley Street, hooning and the lack of parking were a matter of urgency. ‘No one can park, it is a nightmare,’ he said. During the meeting, City officers also acknowledged it would not pursue with the original 10-storey development plans, saying it was out of the question. ‘The community is saying that three to four storeys would be enough to be in keeping with the area,’ the City of Melville officer said. Several businesswomen said more needed to be done to the ‘rundown area’. ‘Riseley Street is extremely neglected and has been for years,’ Anthea Farrar said.